When the term “Shiite Crescent” was coined a few years back, it was meant to warn of Iranian expansionism across the Levant. Nowadays, after the Big Powers’ defeat in the Qusayr battle, Shiite fundamentalism is basking in all the glory of triumph. With the resulting enlistment of hundreds of Iraqi Shiite volunteers in the war overtly championed by Iran, the Crescent is liable to evolve into a political axis stretching from Tehran to Beirut via Baghdad and Damascus. The Iranian Oil Ministry will pull out old maps from its drawers to build the pipeline to pump Iranian oil and gas from Abadan (across Iraq) to Tartus. Why not? The wind is blowing in their favor and I am not making a mountain out of a molehill. Tehran has been mulling and airing such projects for years without actually starting them. But she will, once she settles the Syria war in her favor. It is only natural for her to consolidate victory on the ground by blending her triumphant axis in a singular political, economic and military network. Ayatollah Ali Khamenei, Supreme Leader or Guardian Jurist of Iran, will realize his dream of delivering his sermon from the pulpit of Umayyad Mosque in Damascus, announcing the attainment of Islamic unity he has long promised. He will then pompously step down from the pulpit to stroke the forehead of a wheelchair-bound Damascene boy, signaling that forgiveness is the attribute of the strong. He will then stand next to a group of Syrian Sunni ulema wearing white turbans. There are lots of them, in the mould of Mufti Ahmad Hassoun, ready to oblige. He will shake and raise their hands as camera clicks and flashlights capture the historic moment. The Guardian Jurist will promise that his next prayer – or his successor’s. if he is sufficiently humble – will be in Jerusalem. But he won’t mention the Golan. He knows the Russians are now the key component of the UN monitoring force separating Israeli and Syrian forces on the Heights. Because Takfiris are still mounting desperate operations here and there, he realizes that Syrian troops and Hezbollah fighters are busy keeping the peace in predominantly Sunni cities, towns and townships. In that afternoon, a huge reception will be held in a newly rehabilitated Damascus palace still showing the scars of war to mark the signing of a mutual defense pact by the presidents of Iran, Iraq, Syria and Lebanon. The Guardian Jurist will stand wreathed in smiles in the background, perhaps in awe at the likely appearance of the Hidden Imam to bless the agreement. We turn southward to Riyadh and find the capital calm and dusty but concerned the battle was settled in favor of Bashar al-Assad and his partners. Riyadh is conscious the clean sweep is not Bashar’s but that of Iran and the old Khomeini scheme. Bashar becomes the representative of Vali e-faqih in Damascus. Riyadh is also alarmed by Iranian activity in its surrounding area. It fears for Bahrain. The Houthis have won uncontested control of more than half the old North Yemen. South Yemen, Saudi Arabia’s traditional ally, is being gradually eaten away by Iran. Gulf unity plans have dissipated. Some Gulf countries are keen to flatter Iran so as to preserve a modicum of their national sovereignty. The Arab common market and Fertile Crescent idea evaporated and with it the dream of resurrecting the Hejaz Railway that ran from Istanbul to Holy Mecca across Syria and Jordan. 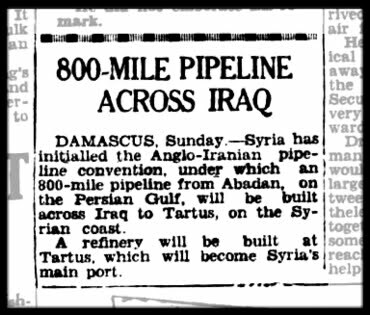 Even the Europeans are buying the Iranian oil flowing through the Abadan-Tartus pipeline. They are also thinking of linking the European Gas Network with its Iranian counterpart. They have forgotten all about sanctions because the world always prefers to deal with winners. On the Arab Gulf home front, young men are seething. They feel their governments let them down by failing to face up to the Iranian stratagem. The young men are in a sectarian tinderbox and buckling under economic stress. Extremism is rampant and the security services are busy hunting down extremist groups. A nightmare, don’t you think? That’s why I believe Saudi Arabia expressly will not allow Iran to win in Syria. Iranian presence there proved a burden from the day Hafez al-Assad sealed his alliance with Iran’s Islamic Revolution as soon as it took over power 40 years ago. Whereas the Syrian regime’s muscle under Hafez left a margin of balance and independence in the partnership, his son submitted totally to the Iranians and Hezbollah. It is thanks to them Bashar is still alive and ruling a country in ruin. Instead of being their partner, he has become their subordinate. The implication is that Iran’s presence in Lebanon and Syria now constitutes a clear threat to Saudi Arabia’s national security, and Turkey’s as well. Consequently, Saudi Arabia must do something now, albeit alone. The kingdom’s security is at stake. It will be good if the United States joined an alliance led by Saudi Arabia to bring down Bashar and return Syria to the Arab fold. But this should not be a precondition to proceed. Let Saudi Arabia head those on board. Let us put aside any misgivings about sequels of the Arab Spring, the rise of the Muslim Brotherhood and Turkey’s ambitions. Let the objective be to bring down Assad fast. The objective is bound to draw together multiple forces ranging from the Anbar tribes to Hamas to Egypt’s Brothers to Tunisia to the Gulf Countries. That would entice Turkey to partake in the alliance. France could follow. And whether the United States does or does not breeze in is inconsequential. After all, it’s our battle and our security. U.S. security is not on the line. Labels: Assad, Bahrain, France, Gulf, Hezbollah, Houthis, Iran, Iraq, Khamenei, Lebanon, Riyadh, Russia, Saudi Arabia, Shiite crescent, Shiites, Sunnis, Syria, Tartus, Turkey, U.S.
Syria: Will Obama’s key women make a difference? Did Obama-Assad reps meet in Barcelona?